As you commute around Sydney city what do you notice? We live in close accessible communities and yet we do not know the people who travel in the same space as us. Jen Aboki decided to get people talking. It all started when Jen Aboki , a Sydney city commuter, noticed that more and more people on public transport were staring down at their mobiles. She found it interesting that two people could share a seat and not even say hello. Jen asked herself a question, “What would happen if people started having conversations?” From this Care 2 Converse was created. Essentially Care 2 Converse is a project created to inspire conversations in the community. It involves people wearing a visual symbol which shows the people around them that they are open to having a chat. Hopefully, as more people wear the symbol more conversations will spontaneously occur. Jen hopes the project will help to foster a real sense of community. Opportunities for conversations are everywhere, whether you are on the bus, in the queue at the grocery store or waiting for your morning coffee. Casual conversations could brighten up your day. Research by Gillian Sandstrom and Elizabeth Dunn in 2014 shows that the small interactions we have could have as much impact on our happiness as interactions we have with those closest to us. Jen believes the Care 2 Converse conversations will make a real difference to the wellbeing of individuals and their communities. So how do you participate? Jen invites you to make the Care 2 Converse pledge. By signing up you will receive a free badge or wristband in the mail. You can also buy more merchandise from the shop. Care 2 Converse works on a “Pay if Forward” system, each purchase from the shop equals more freebies for others. Will it make a difference? Only one way to find out! Jen’s hope is that it that simply by seeing someone else who “Cares to Converse” people will have a sense of connection even without conversation. The real magic is seeing how a simple conversation could bring a smile to your day. 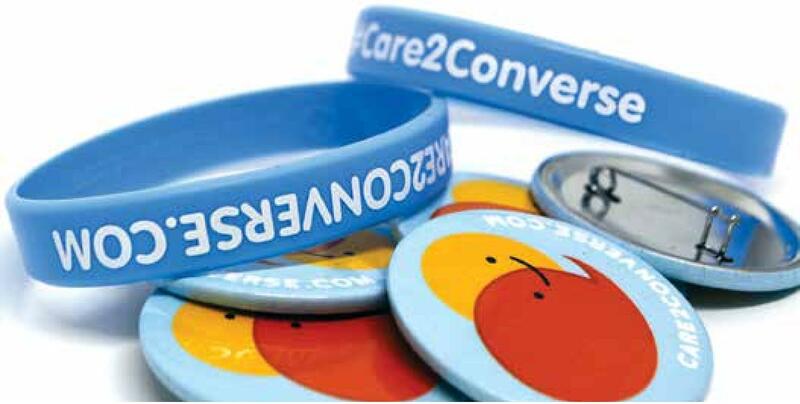 Share your stories on social media #Care2Converse. Kahneman D., Krueger A.B., Schkade D.A., Schwarz N., Stone A.A. (2004). A Survey Method for Characterizing Daily Life Experience: The Day Reconstruction Method, Science. Dec 3;306(5702):1776-80. Sandstrom, G.M., & Dunn, E.W. (2014). Social interactions and well-being: The surprising power of weak ties. Personality and Social Psychology Bulletin, 40(7):910-922.